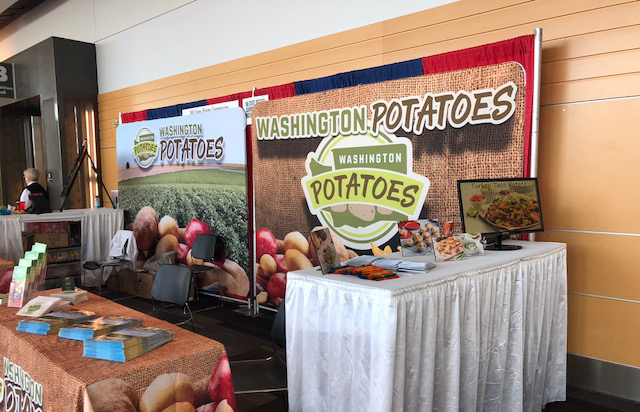 Last week, school meal program employees gathered at the Tacoma Convention Center to attend the annual Washington School Nutrition Association Conference. This event allows attendees to participate in nutritional classes and learn about new products that can be incorporated into school meal menus! WSPC staff had the opportunity to speak with attendees from across the state and share information about how Washington potatoes can benefit meal programs! As the show went on, our “Spin to Win” contest proved to be a crowd favorite! People were lining up to test their luck with our prize wheel! WSPC passed out several promotional items including aprons, oven mitts, coffee mugs, insulated cups, tumblers, phone wallets, chip clips, potato stress balls, spatulas, lunch boxes, cookbooks and more! On Monday night staff members attended the conference “Night of Entertainment.” This event was a 70’s themed sock hop! 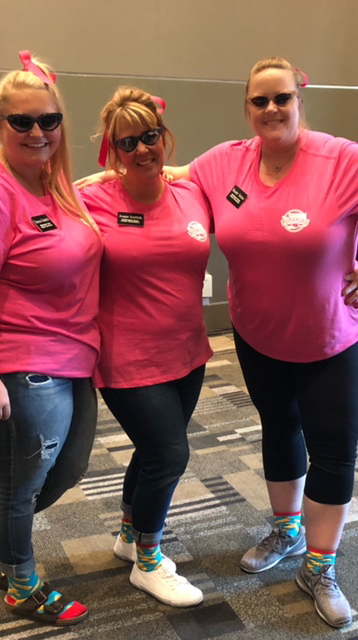 WSPC staff got creative and dressed up as the “Pink Potato Ladies.” This social event allowed attendees to have some fun and get to know one another! Without a doubt, this event was a huge success! Many people throughout our state took home an important message: potatoes are a versatile, popular, affordable and nutritious vegetable that can be easily incorporated into school meals and provide students with key vitamins and minerals!